Liquid Metal Detectors – Foremost Machine Builders, Inc. In many food processing plants, liquids or semi-liquid paste are processed and shipped through elaborate piping sytems to their packaging destination. During the transportation of the liquid foods, metal contamination can occur. Our stationary in-line systems, can control paste-like or liquid products, such as ketchup, toothpaste, tomato paste, and fruit juice, as they are transported through pipes. 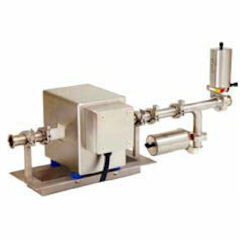 To detect metal in liquid foods as they pass through a pipe, the pipe itself must be designed to be free of metals. Depending on the consistency of the liquid inside the pipe, the metal detection system will use an pistion or butterfly valve ejector system that. Outstanding Sensitivity, Accuracy, Stability and Precision. Product Effect Compensation featuring the ltest four channel DDS [direct digital synthesizer] and DSP [digital signal processor] technology. High Processing Speed – DDS and DSP makes the MPULSE the leader in digital metal detection. Digital balance control – levels temperature and humidity influences. Auto calibration – once the unit is calibrated there is no need for recalibration. Digital Noise Filters – eliminate undesirable signals such as vibrations and shocks. Mulit-channel Technology – for the optimum recognition of all metals; ferrous, nonferrous and stainless. Power supply – wide input 85-265 V AC works great even with unstable and poor power sources. Automatic diagnostics – possible functional defects of the device are displayed on a separate output contact. The separating piston is also taken apart and cleaned in a very brief time. As a result of a new functional principle, tiny bones can no longer cause blockages. All the seals are long-lasting and reliable. Our metal detectors can be used as inline systems for paste-like products using a special piston ejection valve, which can be dismantled by hand and cleaned in just a few easy steps. Stainless steel with elbow valve for special hygienic requirements. No product confinement or jamming of solid matter. Special, high-pressure resistant pipeline with additional flexible properties, to buffer pipeline against strong impacts. These impacts are caused as the mass is being pumped through the pipeline.